There is a wonderful trend of institutions putting old, grey literature online. One widely used platform for doing this is called “dSpace”, though the approach exists under other names. Some of the best of this material are graduate theses and dissertations. These are freely available if you walk into the University library, but may be essentially unavailable in any other form. Unlike a lot of digital initiatives, the majority of these are not limited to students and faculty, but can be accessed by anyone – provided you know they are there. Consider Doris Lundy’s monumental MA thesis on NW Coast Rock Art, obtained in 1974 from SFU. Most of this 350+ page thesis was never published in any form. Now you can download the whole thing from SFU (4 meg PDF). Despite being a rocky scan, the entire text is searchable. There is some digital protection applied but I found it simple to save a copy to my hard drive. The image to the left is the famous salmon petroglyph at Jack Point near Nanaimo in Snuneymuxw territory. This is the petroglyph that would be painted with ochre and adorned with eagle down by ritualists if the salmon runs were late or meagre – one of the only such works which has specific beliefs recorded for it. Let me know if you have problems downloading this: it works for me on and off campus, so I presume anyone can do it. This entry was posted in Archaeology, archives, dSpace, Northwest Coast, Vancouver Island and tagged Archaeology, dSpace, fishing, Northwest Coast, petroglyphs, pictographs, rock art. Bookmark the permalink. The salmon petroglyph that you ascribe to Jack Point is from Alaska. 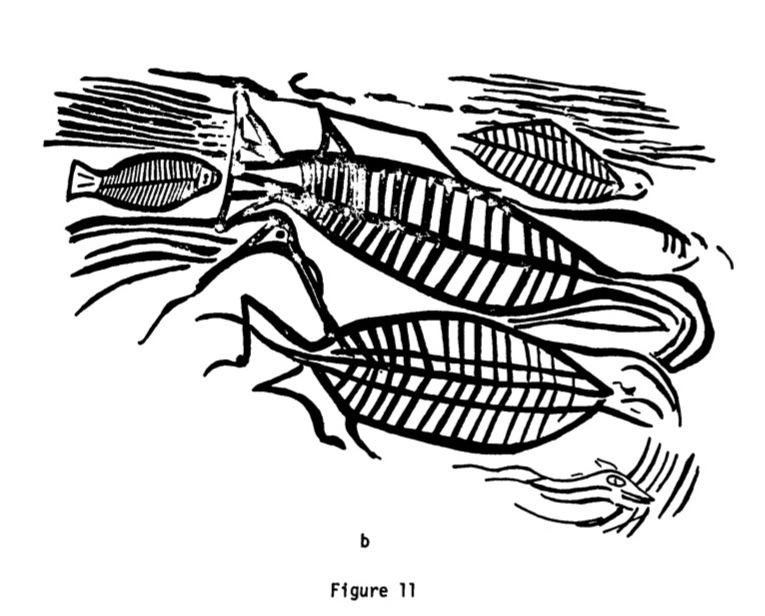 See Page 100-101 (Figure 11 caption and illustrations). Very different styles involved. Oh, thanks Doris – my mistake, I was sloppy when reading the caption in your thesis. I’ve replaced the image with the correct one in case someone doesn’t read these comments. I was hoping to print this PDF file, but it seems to require a password. Is it allowed to print this, and if so, how does one attain the password?